In November of 2016, we visited Italy. One of our most memorable places was to La Secchia Anticia Acetaia in Modena. There we met Lorenzo Righi. Lorenzo if the owner of this family ran Balsamic Vinegar of Modena Company. He was so gracious to give us a private tour and tasting. This company diligently follows the antique recipe, which was made official by the regulations governing the production of D.O.P. (protected denomination of origin) balsamic vinegar. We fell in love. Right then and there we decided we had to include this traditionally aged balsamic vinegar into our business. Lorenzo has honored us with the privalege to offer you the absolute best aged balsamic from Modena. Denominazione di Origine Protetta (“Protected Designation of Origin”). As the the name suggests, this certification ensures that products are locally grown and packaged. Not all Balsamic Vinegar's can be considered as D.O.P. To be part of the category of Traditional Balsamic Vinegar of Modena D.O.P, the final product must have a certain color, a characteristic bouquet, a certain density and a certain flavor. Taster masters will control that every products has all these features before approving it as D.O.P. Only two consortia produce true traditional balsamic vinegar, Modena and neighboring Reggio Emilia. 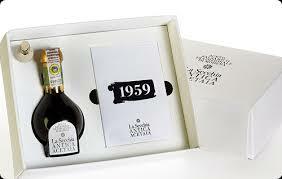 The balsamic is aged for a minimum of 12 years in a battery of several barrels of successively smaller sizes. True balsamic vinegar is rich, glossy, deep brown in color, and has a complex flavor that balances the natural sweet and sour elements of the cooked grape juice with hints of wood from the casks. This wonderful gift set includes one 100 ml bottle of Traditional Balsamic Vinegar of Modena that has been aged for over 50 years. a glass blown spout top and a 64 page cookbook. It is produced in limited quantities and undergoes strict checks by the Balsamic Vinegar Consortium. This is truly a gem for connoisseurs. This ancient and noble condiment is made with the must of local grapes, which are cooked over a direct flame and then aged in valuable wooden barrels. The Extra Aged balsamic has been aged for at least 25 years and comes in a gold package. This balsamic vinegar has a rounded but sharp flavour, which makes it ideal for enhancing boiled meats, seafood dishes and frittatas in its pure form and may be drizzled over beef fillets or mixed into risottos directly in the pan right after cooking to bring out the flavours. The extra aged balsamic vinegar is a product of the utmost quality and has the perfect thickness, complexity and long-lasting taste.